Imagine gazing down an endless pathway of swaying green boughs. The stalks tower above you, allowing sunlight to filter in gently. The forest seems endless to both your left and your right, and the sound of foliage swaying in the breeze lulls you into a trance-like state. Perhaps you’re in solitude at this moment, or perhaps friendly folk wearing yukata robes and geta sandals can be glimpsed in the distance. This peaceful scene isn’t a mere dream – it is the reality you’ll find within Arashiyama’s famed bamboo forest. Arashiyama district is located at the base of the so-called “Storm Mountains”, in northwest Kyoto. Its main street and Togetsu-kyo Bridge have been called a “tourist circus,” but beyond this thoroughfare, Arashiyama offers an authentic and unforgettable Japanese experience. Read on to discover how the bamboo forest is just the beginning. This sightseeing district makes for an incredible day trip from Kyoto. 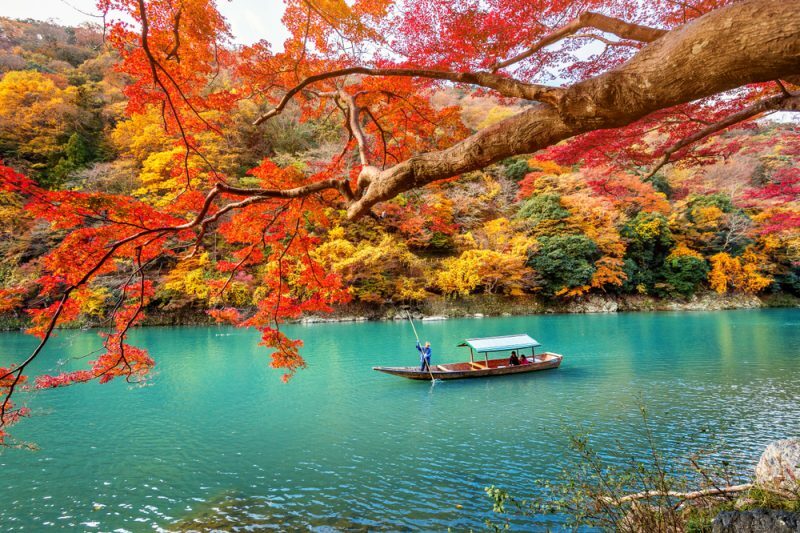 From lush forests to cherry blossoms to vibrant autumn koyo colors, Arashiyama is a visual delight. If you’re lucky, you might catch a glimpse of Arashiyama’s famous fishing method in action. Known as Ukai, skilled fisherman practice an ancient tradition in which trained cormorant birds are used to catch trout. Arashiyama’s Sagano Bamboo Forest, or Bamboo Grove, is both locally famous and world-renowned. 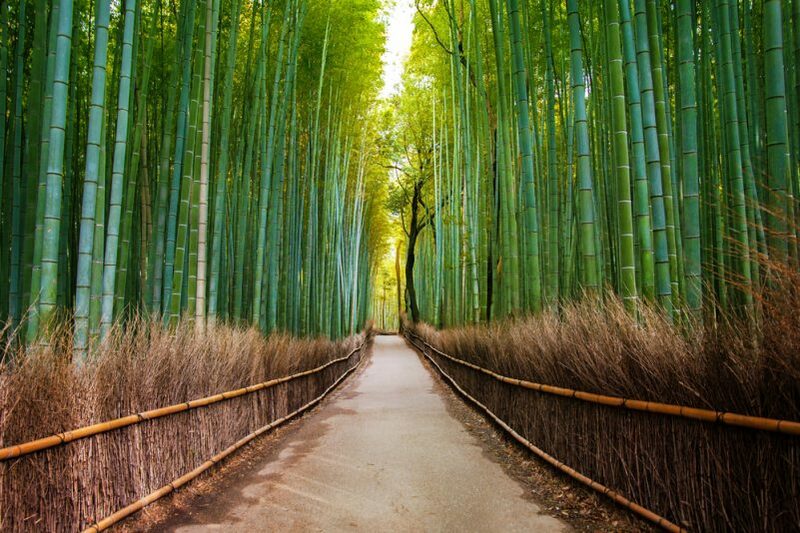 Visitors can stroll paths lined with endless rows of towering bamboo. The experience has been described as other-worldly, serene, and dreamlike. The sound of the rustling bamboo within this forest has been named one of the “100 Soundscapes of Japan” by the Japanese Ministry of Environment. Together with Fushimi Inari and the Kinkaku-ji, it offers a Kyoto experience not to be missed. The bamboo grove is open 24 hours a day and boasts no admission fee, so it is recommended that during peark season, you visit it early in the morning or at sunset. From the JR Saga-Arashiyama Station, you may take a bus, which departs approximately every seven minutes. Alternatively, you may walk about 15 minutes to the bamboo grove. Keep in mind that trains departing from the Hankyu Arashiyama Station are not covered by the JR Pass. Next to the station is the red-brick building of Saga Torokko Station, from where you can take the Sagano Scenic Railway, also included in your JR Pass. This romantic train passes a gorge offering a lovely view along the Hozu River. Arashiyama is an immersive experience that offers something for everyone – from outdoor adventures to somber temples to relaxing getaways. Below are a few of our favorite attractions that Arashiyama has to offer. Japan travel guides often feature images of Japanese macaques, a large species of monkey, lounging in winter hot springs. 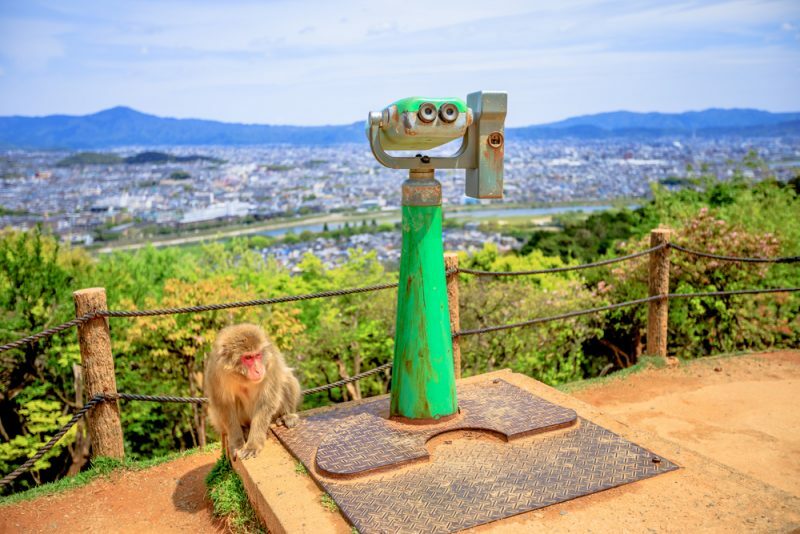 At the Iwatayama Monkey Park (also known as Arashiyama Monkey Park), you can view these animals up close and personal. You can even feed them peanuts and fruit in a designated area. Cross the Tsutenkyo Bridge, another famous landmark, to reach the Iwatayama Monkey Park. From the ticket booth, you will hike for about half an hour along a winding path of both natural materials and concrete stairs to reach the lair of the monkeys. The entrance fee to the Monkey Park is ¥550, less than $5.00 US. The park is open daily from 9 am until at least 4 pm. At the end of the bamboo forest, you can get away from the crowds and reach the magnificent views of Kameyama-koen. This hilltop park, next to the river, it’s particularly attractive during the cherry-blossom and autumn foliage seasons. Look out for monkeys, which sometimes descend from the hills to pick fruit. Staying in a ryokan – a traditional Japanese inn – is a sublime way of getting in touch with authentic Japanese culture. The Arashiyama Benkei ryokan is both traditional and luxurious. The structure served as a country estate for vacationing nobles during the Heian Period (794 to 1185 AD). Shared and private onsen (hot springs) are available, as well as meals served in-room. Rooms at this ryokan rent for ¥30,000 to ¥50,000 per night, or around $250.00 to $450.00 US. Signs for the Tenryuji Temple will greet you as soon as you exit Arashiyama Station. This World Heritage Site has an entrance fee of ¥500 (less than $5.00 US) and offers spectacular autumn colors. The Zen temple grounds house the entrance to the bamboo grove, a symbol of strength thought to ward off evil. Other temples in the area include the Tendai sect Buddhist Nison-in Temple, the Jojako-ji Temple, the thatch-roofed Gio-ji Temple, and the many-statued Adashino-Nembutsu-ji Temple. Finally, you can also visit the Okochi Sanso Villa, home of the late silent movie actor Denjiro Okochi. The villa and gardens cover almost 20.000 square meters, including espectacular gardens and magnificent views of Kyoto city and the Hozu river. A trip to Arashiyama is like taking an excursion to another world – a simpler, more peaceful time. If you’re ready to relax and recharge, book your JR Pass and start planning your next Japan vacation today.